I realized last week that I never shared the details of our Frozen Party! So I thought to kick of the Holidays it would be perfect! You can purchase our Frozen printables here in our shop! I wanted to create a frozen castle feel, so I used large plexiglass “ice cube” and icicles. To make them look more like snowflakes I cut and trimmed the fans when they were folded together to give them a unique, one of a kind snowflake look. I LOVE how they turned out! It added so much to the party table! Here is the silhouette of the large ones I create. Just make sure not to cut in the cardboard strip, as it needs that area to stay together, plus it’s really hard to cut throughout that part! “Ice Cubes” made with blue & turquoise M&M’s in clear boxes. The kids LOVED these! The ice blocks can be made ahead of time too, so it’s an easy dessert to create. I also had gum balls and Cookies and Cream Kisses for kids to nibble on. The little ones loved the kisses, as they were easy to grab and they liked taking them 1 by 1. Snow mountain cake with marshmallow frosting with Frozen figures. It’s a simple cake that the kids can help you decorate! 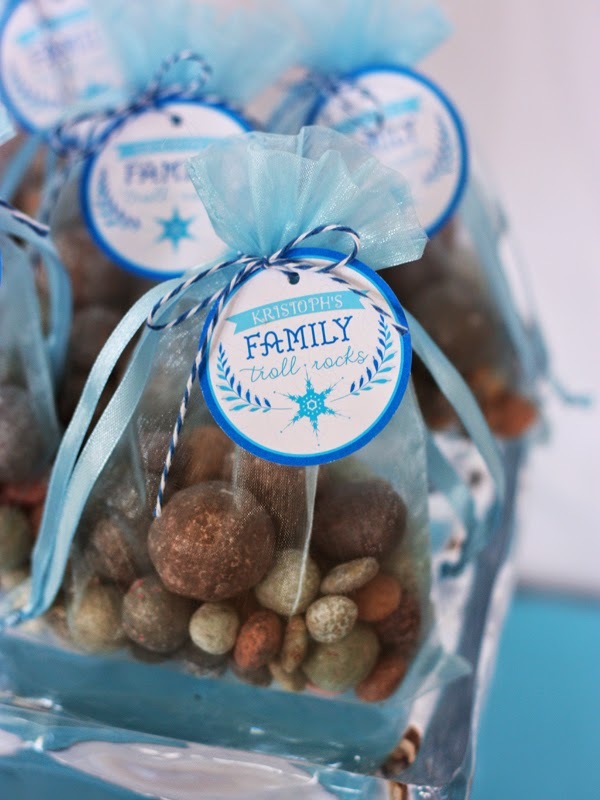 Last, but not least Kristoph’s Family Troll Rock Candy! It was my favorite treat on the whole table, probably because it’s my favorite part of the movie too when Olaf says, “Hi Sven’s family! Nice to meet you. He’s crazy…. why aren’t you running!” Because of that I am offering this tag free! You can get your Free frozen printable tag here. 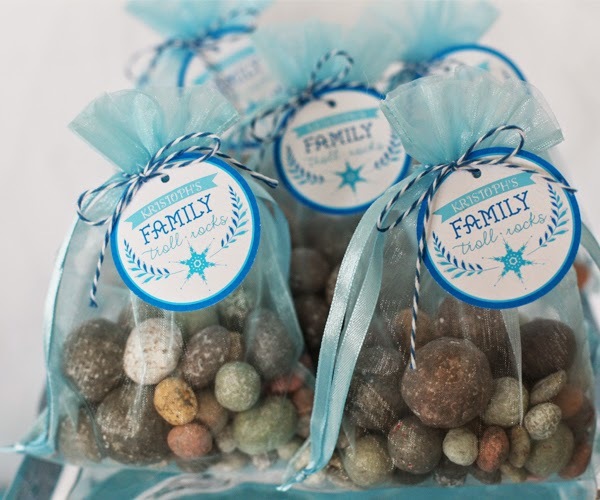 The Troll candy rocks are available here for you to make your own Family Troll Rock favor. For a little activity I put together these Snowman kits for each of the kids to make their own Olaf! They had a blast with this and it was so fun to see the “snowmen” them made for marshmallow. To make the soda a little more special I added 2 straws in each bottle- a blue stripe and a blue polka dot paper straw! Eden really took on the role of Elsa spraying her magical powers all day long….. she even took some of the small snowflakes I made and held it in her hand and tossed them as she splayed her hand out! The cutest part was when little sister started copying her hand gestures, wishing she had a Elsa dress too! « NEW Holiday Christmas cards for 2014 + FREE next day shipping! You inadvertently used a word I don't think you want on your blog when you were explaining how you made the snowflakes out of the paper fans. Thank you for catching that! 😉 I had it all done and published my post and it didn't save so I had to rewrite the whole post. Again, thanks for the catch!!! You have organized a beautiful birthday party for your daughter; I just loved the decoration ideas. I feel you would have planned all that quite early. My daughter have her 4th birthday in coming month and I am looking for best birthday party bar nyc. Have you any suggestions? I love the paper fans that you made into snowflakes! The link no longer works so I was wondering where you purchased them from? Also, it says you bought them in blue and white. What about the turquoise ones? Did you purchase them all from the same website? What a beautiful addition to the party Thank you in advance! The link you provided for the Troll Rock Candy does not seem to bring me to the right site. Any chance you can tell me where to buy it?